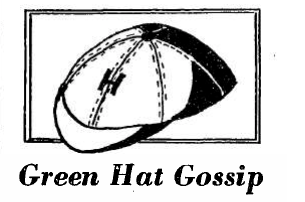 The logo for an old Col­legian “Green Hat Gossip” column. On Sep­tember 26, 1944, The Col­legian pre­miered yet another gossip column. But “Green Hat Gossip” didn’t just spread the campus tales. The author of this weekly piece was a jack of all trades, prac­ticing inves­tigative reporting, giving advice, and deliv­ering some dev­as­tating insults. “Green Hat Gossip” first and foremost focused on uncov­ering the most clas­sified infor­mation at Hillsdale College. In the November 21, 1944 issue of The Col­legian, “Green Hat Gossip” inquired, “We’ve often won­dered how Guila Benner, who sleeps until 7:58, manages to get to an 8:00 class. Won’t you let us in on your secret, Guila?” But actually, Guila, we still want to know your con­fi­dential tech­nique. “Green Hat Gossip” was also an advice column. In the Oct. 10, 1944 issue of The Col­legian, “Green Hat Gossip” offered some counsel to the Hillsdale dorm girls and a boy who seemed to fre­quent the premises quite often. “Davie, will you please run down town and get us fourteen Ham­burgers and a quart of milk? Seems like our wonder-lad is errand boy for South Hall. Take it easy girls.” Petition to bring Davie back to Hillsdale: I don’t need any milk but I could sure go for some ham­burgers. “Seems s’if some mys­te­rious, soft-voiced person has been calling Dave. 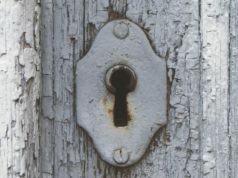 Our advice is to put a guard chain on your frat pin, when you get it Dave,” “Green Hat Gossip” wrote in the Nov. 21, 1944 issue of The Col­legian. The authors of this column were not afraid to put people in their place. “Iris, Queen of Mauck Hall, what makes you think you know all the answers?” the column asked in the Oct. 10, 1944 issue of The Col­legian. Calm down, Green Hat. Iris didn’t choose the queen life, the queen life chose her. The author didn’t put much thought into that one-liner, making an ironic move to award a lazy insult to the laziest man on campus. current col­legian could learn a thing or two from this… a sly sarcasm of the admin­is­tration is much more inter­esting than kow­towing obe­dience. I know, they threaten to kick you out of school and take away your schol­arship, but isn’t that what freedom of the press is all about?